There are plenty of good things to say about Grant Theft Auto V. As a digital creation, it's remarkable to behold. But it also has its share of problems: For all the things Rockstar has gotten down to a science, GTA retains some fundamental flaws that its developers just can't quite seem to fix. I won't be talking about the story here, or the characters, or the pacing, or anything like that. I'm also not really going to talk about all the things the game does right, and believe me, there are a lot of those. Stephen already covered a lot of them in his review, and I'm with him on most points. No, today I'm going to talk about two mechanical/gameplay things I can't believe Rockstar is still getting wrong, all these years after Grand Theft Auto III. Let the negativity commence! Have you ever had a nightmare where a guy is about to shoot you, and you just can't quite seem to get your gun up in time, or aim it in the right place, before he gets off a shot? That's more or less how it feels to play GTA V in free-aim mode. Backing up: GTA V offers three aim-control types. There's "Traditional GTA," which aggressively snaps your gun to the chest of the nearest target in front of you. There's "Assisted Aim," which is a lot like the first mode, and snaps your aim to targets. Then there's free-aim, which doesn't give you any assistance. Free aim is, as I suggested in my article on how to make the game more immersive, a good way to play the game, if you want things to be more difficult and chaotic. Unfortunately, free-aim is also significantly, unnecessarily hampered. To actually play the story missions using free-aim is to make GTA V ruinously difficult. That's because the free aiming—and aiming in general—doesn't work well. That's for a few reasons, best as I can tell, but the primary problem is with the reticle (or, the aiming crosshair), which often seems to have a mind of its own. There's no persistent reticle. When you're walking around in the world of GTA V, not aiming your gun at anyone, there is no aiming reticle on the screen. That makes sense—a game this lovely-looking shouldn't have some floating crosshairs messing everything up! But without even the option of a persistent reticle, it's difficult to judge where my gun is going to be aiming when I bring it up. As a result, I'll usually wind up pointing my gun several feet above the guy who is getting ready to shoot me, meaning that I'll take a couple of rounds before I manage to get my aim together. Yep, that's what happens when I aim down my gun's sights—I'm not touching the camera thumbstick. My aim jerks up all on its own. Aiming is slow and unresponsive. GTA V's aiming works like this: You press the left trigger to bring up your gun, and the camera whooshes in over your character's right shoulder. If you're playing with aim-assistance, you'll snap to the nearest dude, no problem. But without it, you'll have to correct, and moving the reticle while shooting, even with the thumbstick sensitivity all the way up, fails to feel as snappy as it could. Aim-assistance is too helpful. Given that free-aim is a bit of a disaster, aim-assistance is revealed to be the massive band-aid that it is. It's the only way the gunplay can be manageable! With aim-assistance turned on, GTA V's shootouts often feel less like chaotic gunfights and more like carnival shooting galleries. Whack-a-Mole, even. Bad guys pop out from cover, you squeeze the left trigger, your reticle hops immediately onto the nearest guy's chest, and you blow him away. It's a necessary crutch because the shooting—and on-foot controls, it must be said—don't handle well enough without it, but it's still a bummer that the gunplay hasn't evolved beyond GTA IV. Which also had unsatisfying, sluggish gunfights. Rockstar has done this better in the past. So many other games have gotten third-person aiming right that I can't quite fathom why Rockstar can't catch up. Even more strangely, their own 2012 game Max Payne 3 had some of the finest third-person shooting controls I've ever used. Payne had a well-considered combination of assisted aim (for controllers), a persistent reticle, and a consistently smooth range of motion (you could even shoot in 360 degrees while lying on the ground). The game even removed the reticle in interesting ways—when Max is in cover, the reticle disappears, making it a little tricker to gauge shots. The reticle also goes away if you haven't aimed your gun in a while, but the moment you do, it persists for a bit even when you're not zoomed in. Rockstar's 2010 western game Red Dead Redemption worked around aiming clumsiness in a different, but still creative way: It introduced dead-eye slow-motion aiming. But while GTA V flirts with the idea of a bullet-time/dead-eye mode with Michael's special ability, it's constrained to only one of their three characters and it's not as smooth in practice as either of the two previously mentioned games. So, what the heck? Why on earth not make GTA, Rockstar's flagship series, control as smoothly as Max Payne? Why not add some smart new universal time-slowing mechanic like Red Dead Redemption? If the concern was that a floating reticle would get in the way of all the other non-combat things you can do in the game, why not just have it be an optional setting, or make it temporary like Max Payne 3, or have the reticle appear when your character draws his gun, then vanish if he holsters it? Max Payne 3 feels like mechanical innovation; it's a third-person shooter in which the shooting controls better than almost any other similar game I've played. Red Dead Redemption's dead-eye mode feels like smart mechanical problem-solving; it's designed to even out a previously unbalanced system. 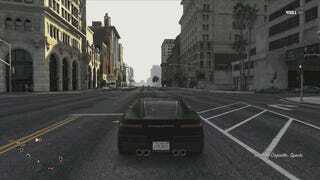 But aside from Michael's special ability, GTA V just feels like 2008's GTA IV. Considering that Rockstar has improved video-game shooting two separate times since their last Grand Theft Auto, GTA V feels like a step backward. Speaking of things that are due for a tune-up… the map in GTA V is a mess. Yes, it shows North pointing in the right direction. It displays streets and it shows the various destinations on those streets. But past that, it's a slow-to-use, counterintuitive drag. How many things are wrong with it? Several things. I'm going to list those things. Setting waypoints takes forever. It is past time that GTA let players set waypoints seamlessly from the game itself without entering a menu. Plenty of other games have managed this; a button or combination of buttons would have to be dedicated to flipping through waypoints the same way you do when you get into a cab. The characters' color-coding is difficult to parse. This is a tough one to solve, but it takes far too many hours of play to fully grok just what the heck is going on with the way the map assigns starting points to main missions and side missions, and assigns different sizes and colors to mission-types and characters. If you're color-blind, you might be out of luck, and wind up walking into someone else's side mission. But my eyes work fine, and it took me what felt like ages to fully get what a small green P? meant, as opposed to a large blue D. It may well just be that I'm slow on the uptake, but I sense there must've been a better nomenclature for this. Navigation is entirely tied to the mini-map: When playing GTA V, you may start to feel as though you're playing the mini-map instead of the game. If you're like me, you'll keep your eyes glued to the corner of the screen for a distressing percentage of your time playing. You might not even notice you're doing it. It didn't have to be that way. 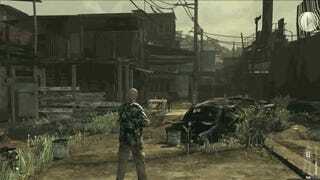 Many open-world games have come up with tricks that offer navigational aids outside of the mini-map. Brutal Legend had columns of light visible from miles out; Saints Row and Just Cause 2 have arrows that pop up on the streets. Rockstar's own GTA: Chinatown Wars did a great job of putting waypoints on the street itself, and Arkham City used the Batsignal to great effect. In the Rockstar-published L.A. Noire, your partner would give you directions, and in GTA IV there was a helpful spoken GPS in most of the higher-end cars. None of those things turn up in GTA V. If you want to know where you're going, you'd better look at the corner of the screen. Of course, not every GTA mission can be like that one. So, which of all those previously-listed potential solutions could have worked best for GTA V? I can't say, but surely there must be some way to let us play the game with our eyes on the road. I get that Rockstar's current system is realistic—who hasn't driven with one eye on the GPS?—but in this case, realism detracts from the game. There's a paucity of mini-map customization options. I talked about this earlier this week, but I might as well reiterate—I'm bummed out that there aren't more options with the mini-map. The "blips" mode would be a good middle-ground between the full mini-map and none at all, but for reasons known only to God and Rockstar, they've removed the health/armor/special bars from the bottom along with the map. That makes blips mode far less functional for actually playing the missions. Furthermore, there's no option to make enemies not appear on the mini-map, which turns gunfights into exercises in "eradicate the red dots." A few more HUD and map-customization options would have gone a very long way toward making GTA V enjoyable for a wider variety of players. Two facts stand in uneasy balance: One, GTA V is a very cool game about shooting and navigating an open world. Two, the actual shooting and navigation leave a lot to be desired. That may seem a little bit like, "Other than that, Mrs. Lincoln, how did you like the play?" But actually, the rest of the game has so much going for it that it's still possible to accept those significant mechanical shortcomings. And I do appreciate all the little ways the game has been improved over its predecessor, from the weapon- and radio-wheels to the much snappier driving controls, along with Franklin's show-stealing special driving ability. Given the fact that Rockstar hopes to make GTA V into a game that lasts through many years and updates, there's a real chance that they'll address some of this stuff—particularly the borked aiming—in a patch. Here's hoping. It's a bit of a shame that Rockstar, with all their hundreds of talented developers, thousands of man-hours and millions of dollars, still can't quite get some of this stuff right. 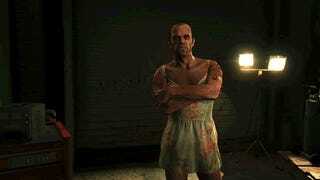 I was hoping for a GTA V that controlled like Max Payne and let me get around like Chinatown Wars. What I got was a brand new game with a lot of shiny cool stuff, but a disappointing number of the same old problems.